After several months of work, We Will Reap What We Sow is now published. Hopefully, it will get as much attention as Future Harvests. And what exciting three years these have been! The reason for me to start The Food Futurist was my frustration about getting clear answers on the ability of agriculture to produce sustainably and to keep meeting future demand. Unlike today, there were not many articles about feeding the world by 2050, simply because food was cheap and the world seemed to experience a never-ending economic boom. Things changed and a couple of food price increases got the attention of many who did not pay attention, while they should have. The few organizations that were addressing the topic did not publish anything satisfactory to me. The doom and gloom messages of we need two Earths (three or even four for some) did not really bring any useful response. This is why I started this blog. I wanted to write down some of my thoughts and sort out the information that I could find. At the beginning, I had no master plan about what it could become. Then, I started to see the traffic on this website grow by the day. I realized that the future of food and agriculture mattered to many people, and that happened all around the world. This led me to write Future Harvests in the winter and spring of 2010. At that stage, it felt a little lonely, in the sense that my investigations did not support many of the mainstream thinking. Very quickly, it became very clear to me that hunger was about much more than just food production. I also could deduct from numbers that the world already produced enough to feed 9 billion with a sufficient and balanced diet, even 40 years before the mythic year of 2050. When I make that statement, I can see eyebrows rise. This fact still is little known, even within a number of organizations involved in food and agriculture. I am always surprised by their surprise. The good news is that, nowadays, more and more people and reporters bring it up. Feeding the world gets easier once some myths fall. In an article, I had indicated that world agriculture has the potential to feed 12 billion. Needless to say that I was pleased to read that same number on the FAO website a few months later. What I discovered was the scandal of food waste, the relative lack of action to fix it, while the numbers show that it is quite feasible and not that expensive at all. By then, the issue was a matter within rather confidential circles. The economic crisis, especially in the USA, has opened the eyes of the aberrant behavior of consumers in rich countries. Considering that 30% of food is lost and wasted, this issue could not stay under the radar. I have raised it every time I could, and I hope it contributed somehow to an increased awareness of the problem. Similarly, through my preliminary research, it became obvious to me how large the potential of Africa is for food production. A couple of years ago, I was one of the few who were claiming that Africa could and should feed itself, as well as it has the potential to become a net exporter. I got the same risen eyebrows and skeptical looks from my interlocutors. By then, reports about Africa were about all the usual negative stories. The only story about African agriculture was the so-called land grab, with the emphasis on making it a neo-colonialism. None of the articles I could read even bothered estimating the potential of food production. For the sake of rejecting this neo-colonialism, the only stance was apparently to consider the status quo, poverty and hunger, the better choice. How pathetic was that? A couple of years later, everyone is talking enthusiastically about the great potential of Africa, and how much the world needs it. My words in Future Harvests were “what happens in Africa will affect us all, for better or worse”. I am glad that more and more people see this. Nowadays, there is a lot of enthusiasm about Africa. To that, I would warn that there also still are many challenges to overcome. 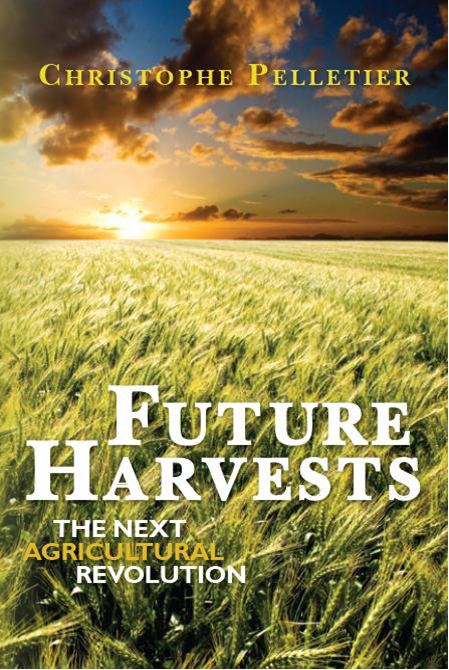 To me, what made Future Harvests different from other publications was the fact that it was comprehensive and non-partisan. In particular, the comprehensive character of Future Harvests makes the book a cut above from other publications. Usually, reports, articles and books about the topic of feeding a growing population are focusing on a particular area or with a particular bias to try to influence the thinking about future decisions. There is none of this in Future Harvests. I looked at all areas, the land, the desert, the cities and the oceans. As many systems are no longer workable for the future, I reviewed many innovations to see if there were alternatives. The section of Future Harvests dedicated to innovation presents an abundance and diversity of ideas being developed. It is not exhaustive because the list would be too long. My purpose was to give an idea about the resourcefulness available to fix problems. Those who read the book confirmed that such creativity gives a lot of hope. In the book, I also emphasized the need for pragmatism. Too many articles try to advocate for either big large-scale industrial agriculture or for all natural, small-scale subsistence-like farming. None of them is a universal answer. Anyone with knowledge of agriculture knows that farmers must adapt to their natural, political, social and economic environments. The right production systems derived from a harmonious balance between these components. Dogmatism is rigid and rigidity is an impediment to the ability to adapt. Hope is certainly better than the doom and gloom people out there. It is sad to read sometimes how negative they are. It feels like they are trying to demotivate people who have positive energy, for God knows what purpose really. One rather famous expert in the field of environment and agriculture, who actually has been an inspiration for me to get in this food and agriculture foresight business has become a disappointment to me. Statements such as “we are only one poor harvest away from a food crisis” or “the urban poor will be the most affected by high food prices” do not tell anything that anyone with half a brain already knows. Everyone can push to an open door. It does not take an expert. However, the media love this kind of depressing and scary stuff. Now, The Food Futurist has reached its third anniversary. This work has brought me a lot of satisfaction. Future Harvests sold nicely, although I hardly advertised for it. I have done work for large organizations in the field of food and agriculture about the topic of the future, and the demand keeps coming in. The interesting part is that I really do not advertize at all, except for what I write on this website. My customers appreciate much more than the knowledge I bring. They like the fresh angle from which I look at the subject. My being independent is conducive to candid discussions without the tension that some of the controversies in food and agriculture usually cause. We review what is best for the future. The criticism is positive and always focuses on developing viable solutions. Three years after I started writing and speaking about the future of food and agriculture, every newspaper is publishing a story on the topic, every company or non-profit in the food sector is posting a YouTube video about it. Unfortunately, most of them are rather incomplete and tend to repeat the common myths. Many of them, not all of them, seriously overlook the number of dots that need to be connected, and the complexity of the entire system. The risk is that we might end up barking at the wrong trees and address problems sub-optimally because of that. Anyway, they bring the issue to a larger audience. That is what counts the most. It is also very humbling to see groups of a couple of hundreds of scholars and experts from all over the world spend a couple of years to publish reports on the subject, and to see that, so far, I have not forgotten anything in my books. Since I like to be ahead of the pack instead of following it, I am bringing out more material. 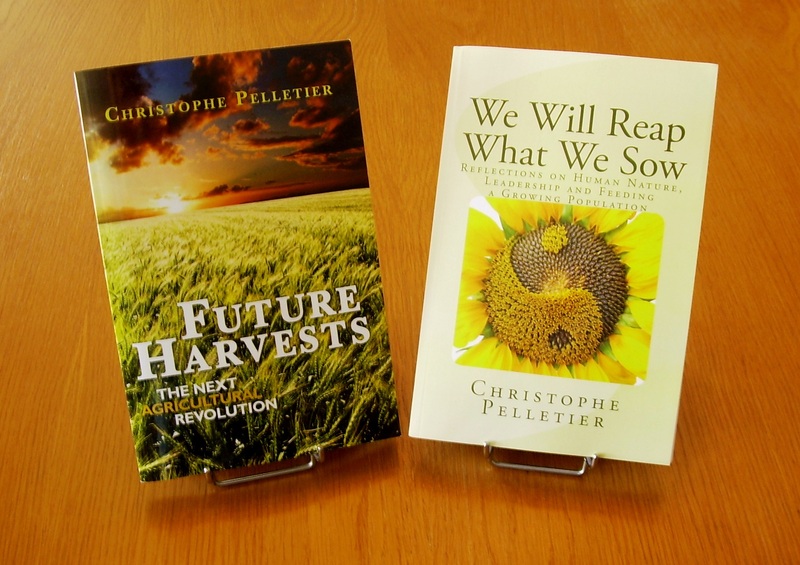 Soon, I will publish my next book “We Will Reap What We Sow”. This book will focus on two areas that are rather neglected, yet essential to succeed in balancing food demand and supply. They are human nature and leadership. Human nature’s little flaws make it a fascinating subject, while they certainly raise reasonable concerns about humanity’s ability to do the right thing. Leadership has the role to alleviate these flaws. It has the duty to make society function properly by enforcing the values that ensure long-term sustainable prosperity. The book mixes number crunching and rational elements with a more philosophical reflection on how humans can work together to produce the food they need, while at the same time maintaining the capacity to do so for the generations to come. Diets, functioning of markets, influence of prices on people’s decisions are all presented in We Will Reap What We Sow. As the title suggests, the book indicates clearly that, although we are free to make the decisions that are best for us, we cannot escape the consequences of our actions. In these three years, I have gathered so much material and knowledge, that I will publish soon a third book which will be a quick overview of which parts have potential for which food production. Tomorrow’s powerful nations are the ones that have something the world needs, and food is one of these things. That will be the theme of that last book. You are currently browsing the The Food Futurist blog archives for May, 2012.